To get rid of grass between patio stones, you’ll have to apply a bit of elbow grease. 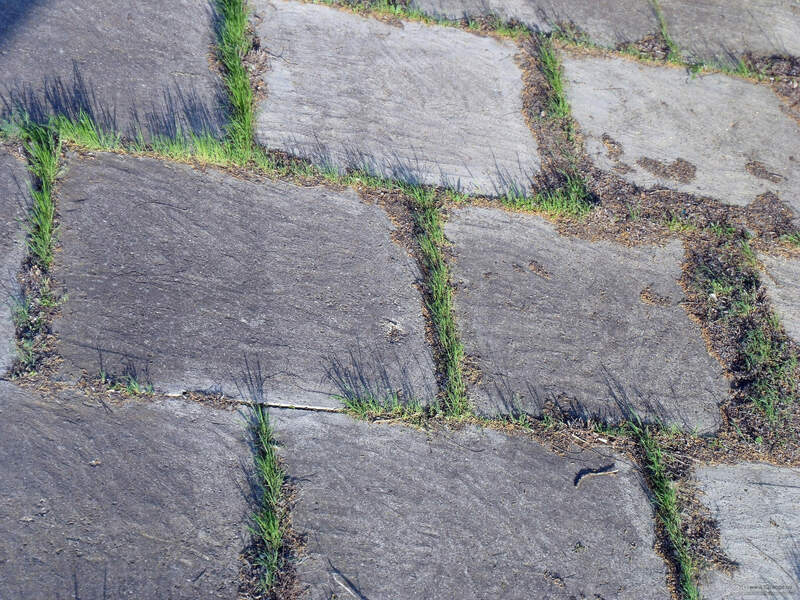 During the spring and summer, it’s practically impossible and downright frustrating to keep weeds and grass from sprouting-up between patio stones. Because we are in a subtropical climate and there’s plenty of rain during the spring and particularly during the summer, grass grows at an impressive and infuriating rate. Mowing quickly becomes once a week chore and all the while, grass is growing around and between your patio stones. Because there’ no real room to work, you can dig down and pull it out by the root. An alternative is to pull up the entire hardscape feature, spray the area with a grass killing herbicide, and, then covering the whole area with landscape fabric, only to reset the patio stones. That’s simply too much effort for such a trivial aesthetic annoyance, but, there are other ways you can make your patio a grass-free zone. One ill side-effect of grass growing around and between patio stones is that’s it’s organic matter. It runs its life course, then, withers and dies. Unfortunately, the decay attracts pests and can cause discoloration. This leaves it looking worn, dull, and just plain unsightly. The best way to keep your patio clean is to do the simplest thing on a regular basis: sweep it. Use a broom to sweep it off on a weekly basis, in combination with a leaf blower to make the task easier. If it looks dull, you can bring back its vigor with a little elbow grease. Use a garden hose to spray it down and then scrub it with a long handled brush and dish-washing liquid. If there are black and green spots, this is probably mold and mildew. Use a combination of bleach and water. Once scrubbed, spray the patio down again to rinse and repeat the process, if necessary. It might take two or three times to see results. With a little work, you’ll have a great looking surface once again, though, the grass will probably still be a problem. Clear the patio off completely. Remove anything that’s on the patio to have ample room to work and to avoid any tripping hazards. This is a good time to sweep the patio off, if you haven’t already done so to clean it. Use a weeding knife between stones. This will be a time consuming job, but a necessary step to get rid of that unsightly grass. Dig down between the cracks and joints with a weeding knife, cutting into the roots. Pull clumps of grass up by hand, along with the roots. Carefully discard of any pulled grass. When you pull the grass up, don’t just toss it aside or lay it onto the patio, because you could be spreading more seeds to spur more growth. Place everything you excavate into plastic bags to avoid this mistake. Spray into the joint with herbicide. Once you’ve cleared all the joints and cracks of grass on your patio, you can then spray herbicide into those trouble areas to help kill any remaining seeds and roots. Give it as much time to work as recommended by the manufacturer. Brush sand between the cracks to prevent future growth. Spread sand over the surface of the patio with a shovel, then brush it into the joint and cracks using a broom. Spray the entire surface down with a garden hose, forcing the sand to compact. Repeat the process until the sand is level with the surface.